I originally had intentions to post this Monday (it was all written all I had to do was upload and edit the photos) but life got in the way (as it does sometimes). So just go back and imagine you are reading this and it is still Monday! In the “real world” or my non-blogging world I love when the first day of the month is a Monday… it means a full round of a fresh start… a new day, a new week, and a new month. However with this blog and my cookbook of the month features it kind of makes it a little difficult. I had to scramble and post the “bonus” 5th recipe on Saturday then turn around and post January’s cookbook recap yesterday. Not giving me the opportunity to create an individual post about February’s new cookbook before I start posting the recipes (you all may not care, but this is how I like to do things around here). I had another cookbook picked out for this month however I received a package in the mail a few weeks ago and decided to change things up. Back in November one of my favorite blogs, Taste and Tell, (I have like 25 cooking blogs that are my ‘favorite’ : ) ) was having a cookbook giveaway. To my surprise I won!!! To make it even sweeter, Deborah, the foodie who writes Taste and Tell, announced me as the winner on my birthday! How fun is that… I won a giveaway AND I won it on my birthday. 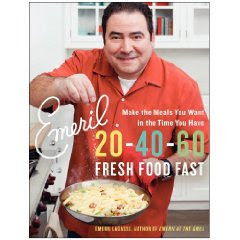 The cookbook was Emeril’s new cookbook: Emeril 20-40-60: Fresh Food Fast. Immediately when I received it in the mail a couple of weeks ago I knew I was going to feature it this month. Let me just start by saying that I love this cookbook. Not only because I won it, and I won it on my b-day, but it is a great cookbook. This cookbook is divided into 3 section- meals that take 20 minutes to prepare, 40 minutes to prepare, and 60 minutes to prepare. Each section has soups, salads, sandwiches, appetizers, main entrees, and desserts. And each section has about 20-30 recipes (score!!). There are ton’s of pictures and not only does each recipe list your usual ingredients and directions but each recipe in this book also has prep time, cooking time, and cooling time listed. Recipe ingredients are pretty standard and if there is a ‘specialty ingredient’ needed they are all pretty easy to find at any grocery store. The directions are well written and each recipe (even the 60 minute ones) seem easy enough to prepare. The one qualm I do have with this book is that serving amounts are not listed. I found this out the hard way when I went to make the recipe below. 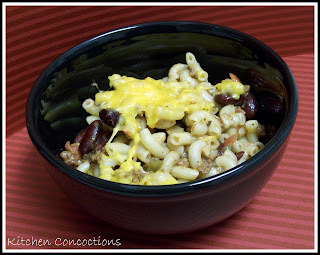 This chili mac was in the 60 minute section but it really only took about 40 minutes from start to finish. It tasted great and is a dish that anyone, all ages would love. The recipe does call for jalapenos and chili seasoning but if you de-seed the jalapeno it is not terribly spicy, just enough hint of spice (of course you could keep the jalapeño seeds in and add more chili seasoning if you want the extra kick). Even though this was delicious and Eric and I both had seconds we did not even put a dent in this chili mac. The full recipe makes a overflowing full 9×13 pan. Which is perfect if you have a crowd to feed. Good thing it tasted so good and we like leftovers because I took some for lunch today and we will be eating it again for dinner tonight. Notes: The original recipe called for 2 pounds of beef. I thought that was way to much since there are also beans and of course the pasta. In the end I am glad I only used 1 pound of ground beef considering the large amount of food this ended up being. Also the original recipe called for 5 tablespoons of chili powder, again I thought this was a little excessive. I used 1 1/2 tablespoons chili powder and 1 1/12 tablespoons taco seasoning. I thought that this was the perfect amount and combination. My changes are expressed in the recipe below. Heat olive oil over medium-high heat in a 6-quart soup pot. Add onions, jalapenos, and 2 teaspoons of the salt and cook until soft, 2 minutes. Add ground beef, chili powder, taco seasoning, oregano, and garlic and cook, breaking up any clumps of meat with a spoon, for 5 minutes. Add tomatoes, beans, and 1/2 cup of water, stir, and bring chili to a boil. Reduce heat to a simmer and cook until thickened to chili consistency, about 20 minutes. Taste and add 1 more teaspoon salt, if needed. While the chili is simmering, cook macaroni according to package directions in boiling salted water, drain in a colander, rinse under cool running water and set aside. Grate cheddar cheese and set aside. Place a 9 x 13.5-inch or other 3-quart casserole dish on a baking sheet. Once chili has finished cooking, fold in the cooked macaroni and 1/2 of the cheddar cheese. 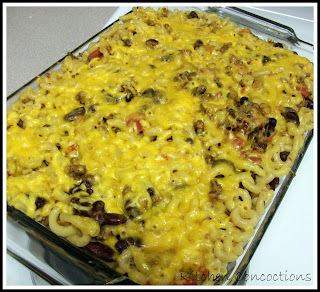 Transfer chili-mac to the baking dish and top with remaining cheese. Bake until heated through and cheese is melted, about 10 minutes. Remove from oven and let cool 5 minutes before serving. Serve each portion garnished with a dollop of sour cream, if desired. See what I mean- an overflowing 9×13 pan.